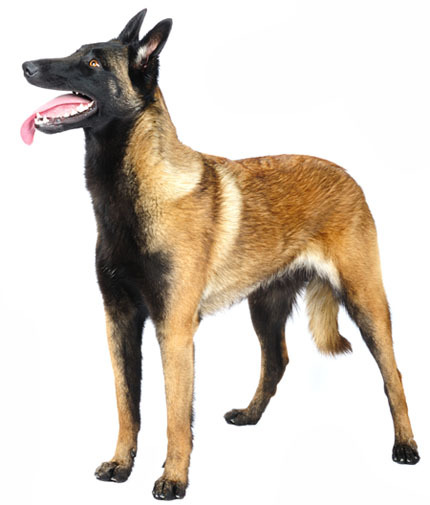 Learn about the temperament and personality of the Belgian Malinois. Discover what he's like to live with, his traits and characteristics and how he generally behaves. And look at lots of Belgian Malinois photos. The Belgian Malinois is a very-fast-learning, highly-trainable, high-energy, versatile working dog. They can make great pets for highly-active, high-energy families. But a Belgian Malinois will not be happy unless he gets lots of daily exercise and has a job to do. Because of this breed's trainability and intelligence, Belgian Malinois are often used today as police dogs, military dogs, and homeland security dogs. Domestic Belgian Malinois excel at obedience, schutzhund, agility, flyball, Frisbee, herding, sledding, and tracking. It doesn't matter so much what their job is, as long as they have one. These are busy "perpetual motion" dogs who need more than just a daily walk. They enjoy hiking, running, and biking, and make good jogging partners. They do best with a fenced-in area to thrash around in. (The alternative is the Malinois zipping around your house, leaping over furniture and smashing into things.) The Malinois is very loving toward his family and reserved toward strangers. They are naturally protective of their owners without being aggressive. They make good watchdogs as they are incredibly alert and will notice sights, sounds, and smells that you don't. They have a high prey drive and will chase small animals. Many Malinois will chase vehicles. When raised around children, Malinois are good with them. However, young children need to be taught not to run past the Malinois waving their arms and shrieking, as this may trigger the Malinois' prey drive. Also, keep in mind that Malinois are tremendously physical animals and might run into a child accidentally... over and over again. He might also try to herd children. (He might also try to herd you and other animals in the house, sometimes all at the same time.) The Malinois is extremely sensitive and social and will want to be part of your family. If he feels neglected, he will entertain himself. By digging holes in your mattress, for example. The Belgian Malinois is very intelligent and easy to train. He learns new commands very fast. The Belgian Malinois is a very heavy shedder. He sheds an awful lot of hair! You'll find hair all over your home, stuck to everything! You'll probably even find it in the butter!